From 3.5 years, we are helping bloggers move their blogs from Blogger.com to self-hosted WordPress platform. It started with a Blogger to WordPress tutorial on Devils Workshop in January 2009. Then moved on to a dedicated portal – BloggerToWP.org (see screenshot) where we took it to a new level. Today, we are happy to announce that our most successful BloggerToWP.org portal is merging into rtCamp.com – our main website! Looks like a going great so far! There is a saying, If it ain’t broke, don’t fix it! But, at rtCamp, we believe in competing with ourself only. If we can make it better, we will just do it, irrespective of our market position and other stats. 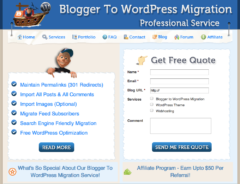 Sometime back, we felt that we can further improve Blogger to WordPress migration process. To accomplish this, we need to invest great deal of efforts and we wanted to do that without making our service too costly! To create win-win situation here, we decided to take back energy we were putting into maintaing a dedicated BloggerToWp.org portal, a dedicated support forum, a dedicated facebook page, a dedicated twitter page & other assets. Self-proclaimed SEO experts may call us fool as BloggerToWP.org domain used to get insanely good ranking on “Blogger To WordPress” keyword. But we never cared about search engines as we run our portal for humans and this change will help humans further! Finally, this change was also essential for reimagined rtCamp! Apart from our open-source WordPress plugin, we have maintained another WordPress plugin to help our paying customers. This in-house plugin has more features. Going ahead, we plan to merge both into one plugin! We have some tools to test if migration is 100% successful. We will be integrating these tools into future version of our WordPress plugin. Automatic quote generator for bloggers who are interested in hiring us. This will save everybody’s time. We will be putting up a open-pricing page, so that you will get an idea about our pricing structure. We will continue to support bloggers moving from Blogger.com to self-hosted WordPress in every possible way because we believe moving to WordPress is right thing to do.